This range of New Tungsten Unit Dose Pig has an open twist which enables it to open or close to reduce the loading or unloading time. This Unit Dose Pig has an overlap design which commonly eradicated the streaming irrespective of the position of the dose inside the pig. 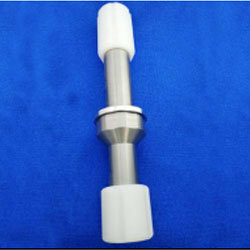 The New Tungsten dose pig is widely used in the safety-engineered syringes. It has a replaceable O-ring, which protects it against the leakage. As the Unit Dose Pig is manufactured by complete tungsten metal which will not let it get damaged by automatic washing. It can be accessed by our clients according to their requirements. A single twist to open or close reduces loading/unloading time. The overlap design eliminates streaming regardless of the dose's position inside the pig. A replaceable O-ring protects against leakage.